Caption Mike Fitzgerald in the Belle pilot house. Captain Kevin Mullen, Captain Mark Doty, and Chief Engineer Jim McCoy drinking coffee and talking to conference attendees. 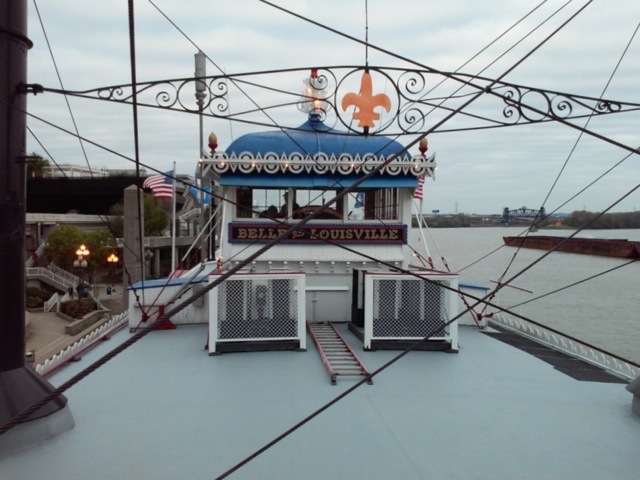 Belle at the Louisville wharf (above) and visiting Belle of Peoria below. 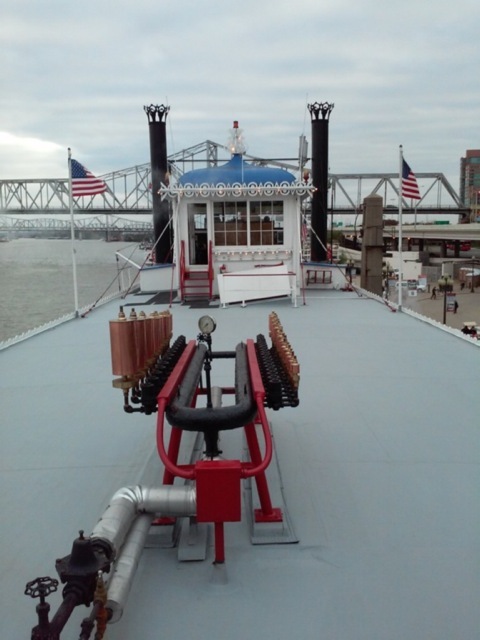 Steamboats.com wishes to thank Randy Davis, alumni of the Belle of Louisville, Natchez IX, Delta Queen, and Mississippi Queen, for sending these photos live from the conference. 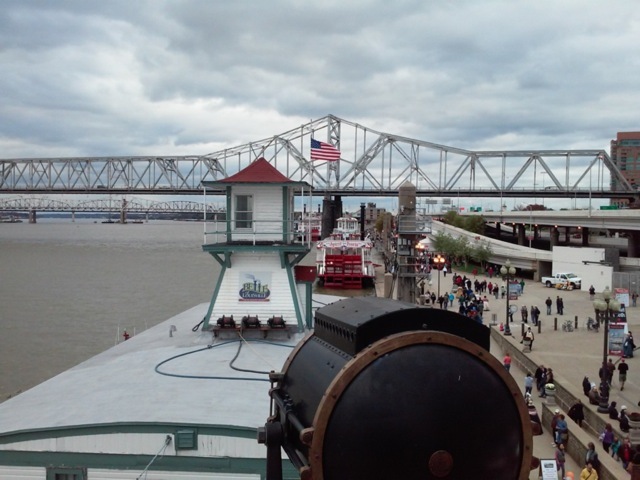 The Belle of Louisville was built in 1914, and is one of only five vintage steamboats still in operation in America. To find out more about the celebration, click here. It ends tomorrow night, Sunday, October 19, 2014. Drive down to Louisville if you can make it for the final day. 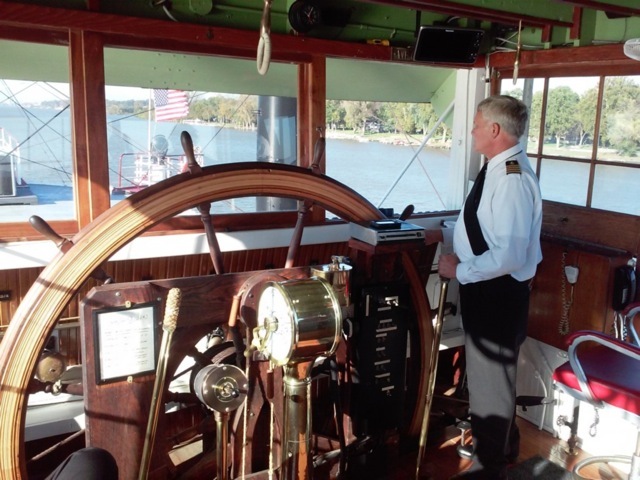 Saturday October 18 photos: the actual day the boat's keel was laid, one hundred years ago. Still going strong. The Delta Queen, present in spirit at the Centennial. 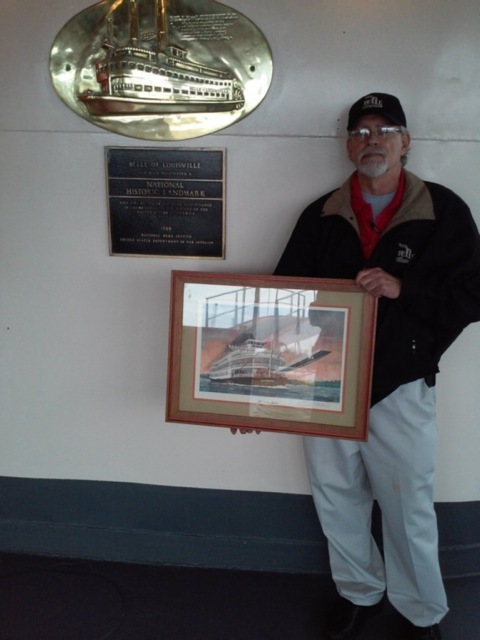 Randy Davis, our photographer, at the Centennial. 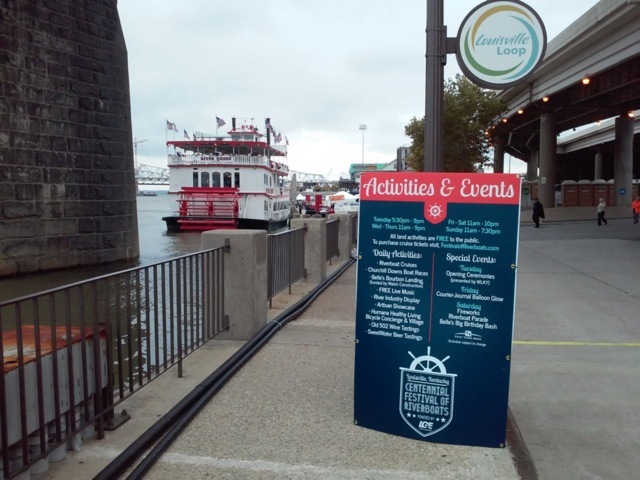 The Centennial Festival of Riverboats, a commemoration of the 100th birthday of the Belle of Louisville, will be at the waterfront from Oct. 14-19. All landside events are free. 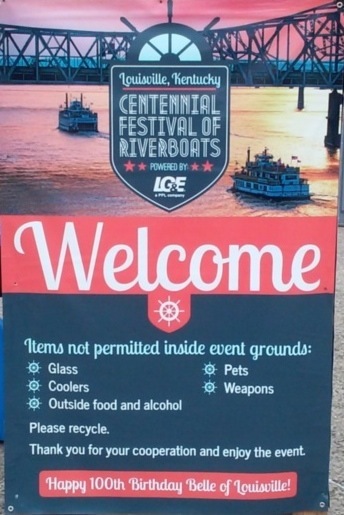 Riverboat cruises are ticketed. Wednesday, Oct. 15 - 11 a.m. - 9 p.m.
Thursday, Oct. 16 - 11 a.m. - 9 p.m.
Friday, Oct. 17 - 11 a.m. - 10 p.m.
Saturday, Oct. 18 - 11 a.m. - 10 p.m.
Sunday, Oct. 19 - 11 a.m. - 7:30 p.m.
• Encompassing one hundred years of transportation on the Ohio River, the display takes visitors on a tour of historic and modern towboats, including the W.P. Snyder and the Coast Guard Cutter Osage. 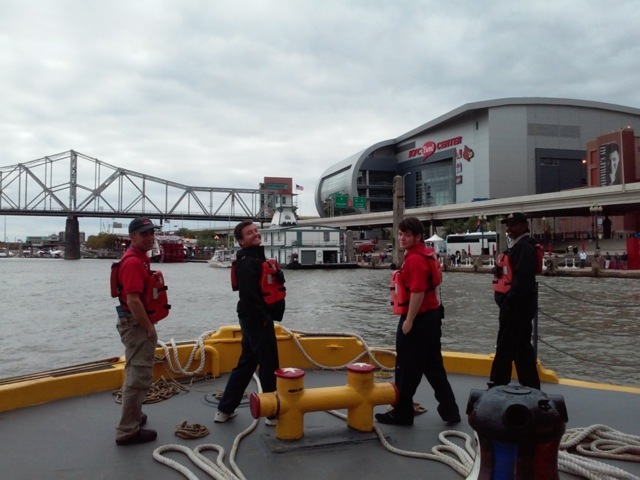 Extending more than two football fields along the waterfront, with 11 boats, visitors will have an up-close, hands on experience appropriate for families and children young and old. The unique and informative exhibit is free to the public and will include steam engines, a knot tying area, river lore storytellers, diesel engine displays, dam model, river career booths and free tours. 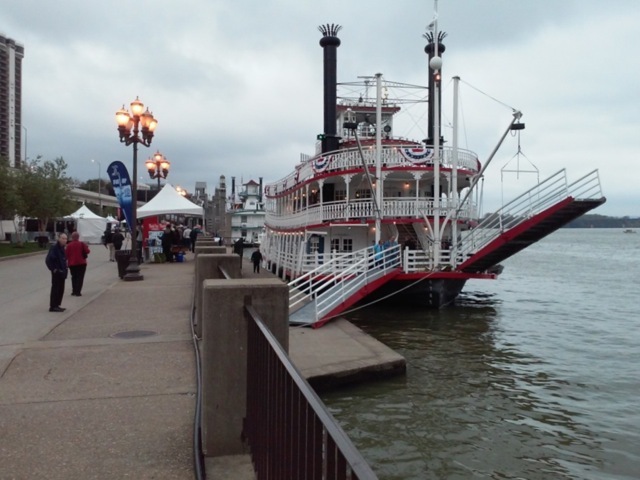 • Inside the festival will be the The Belle's Bourbon Landing designed by stpmj Design, the juried winner of the Centennial Festival of Riverboats Pavilions Design Competition. • As curated by the Kentucky Center for the Performing Arts, visitors will enjoy an exciting blend of music with live performances on two stages by 45 different acts at the award-winning Waterfront Park. • This unique instrument is featured on several riverboats, and while walking through the festival you will hear music of the calliope playing. 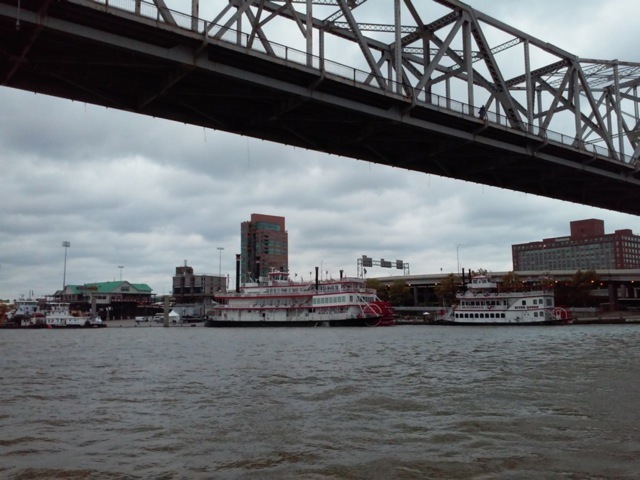 Each riverboat will compete to see who can play the best tunes. 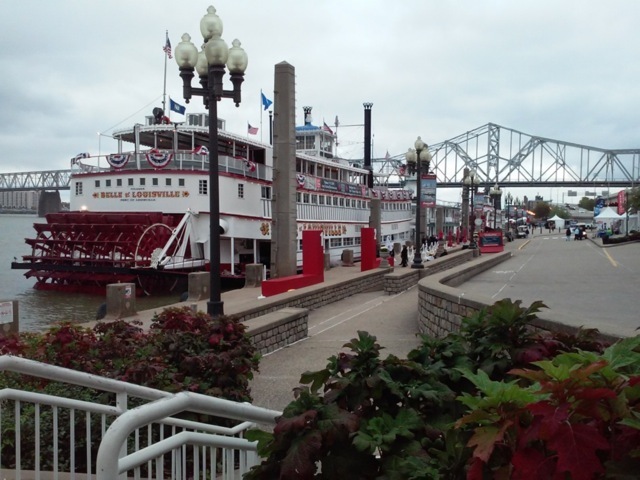 • Daily boat races will take place along the Ohio River. 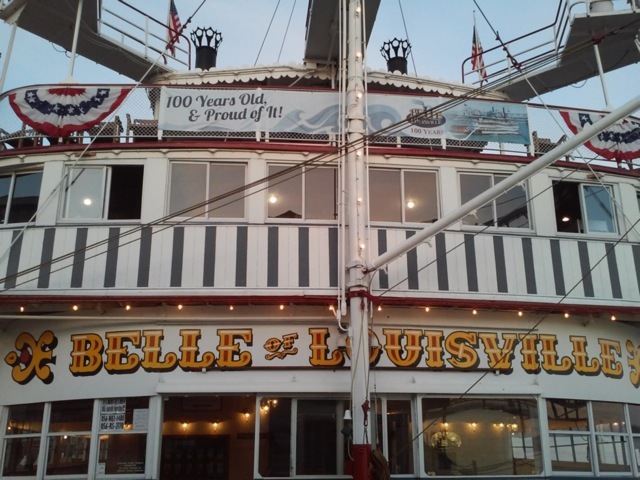 Presented by WLKY on Oct. 14 at 5:30 p.m., there will be a formal presentation to officially open the festival with a rechristening of the Belle of Louisville. Then comes the Belle of Louisville's 100th Birthday Parade - a unique community parade, inspired by the tradition of a New Orleans "second line." Acts participating in the parade include the Rascals of Ragtime, River City Drum Corps and the Kentucky Wheelmen, among others. 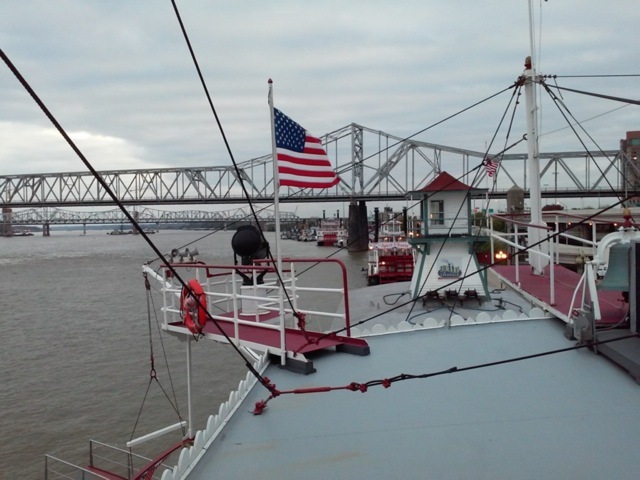 The parade route will start within the park, march through the festival and end in front of the Belle of Louisville. 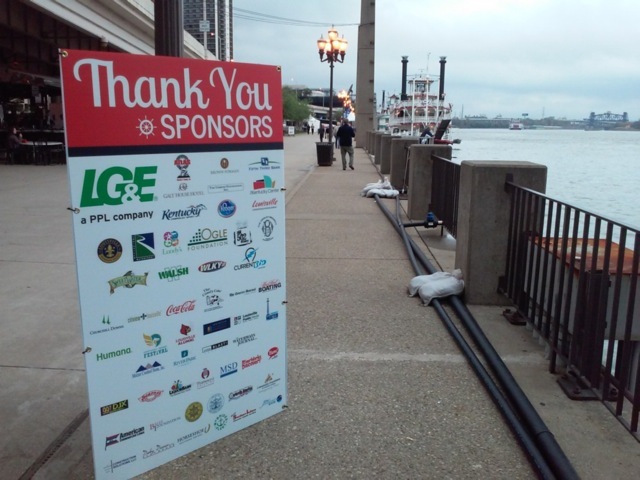 Following the parade Boats will be ticketed dinner cruises. Opening Ceremony Fireworks will close the evening. On Oct. 15 from 6p.m.-8 p.m., hear from select athletes, coaches and the Homecoming Court. From Oct. 15-17, check out Adventures in Water, which is an education festival along the shores of the Ohio River. Teachers of third through fifth grades are invited to bring the classroom to the Waterfront Park for a real-world extension of classroom learning through a multi-content approach. Students rotate through several fun and educational stations provided by community partners to learn about all the amazing ways we use water and connect to the river. On Oct. 17 from 7:30-9 p.m., enjoy a variety of balloons on display on the Great Lawn allowing guests to get an up close personal view of the glimmer and speak with pilots. 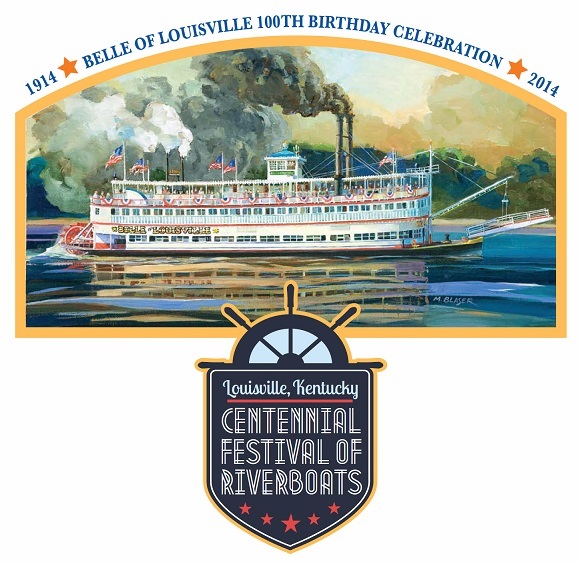 On Oct 17-19, Jeffersonville will host Steamboat Days during Louisville's Centennial Festival of Riverboats. The Big Four pedestrian bridge will link both festivals together for a weekend full of activities. In addition to Jeffersonville's many shops and dining opportunities, Steamboat Days will feature a juried art village, live art demonstrations, live music on the Riverstage, a parade and a children's area. 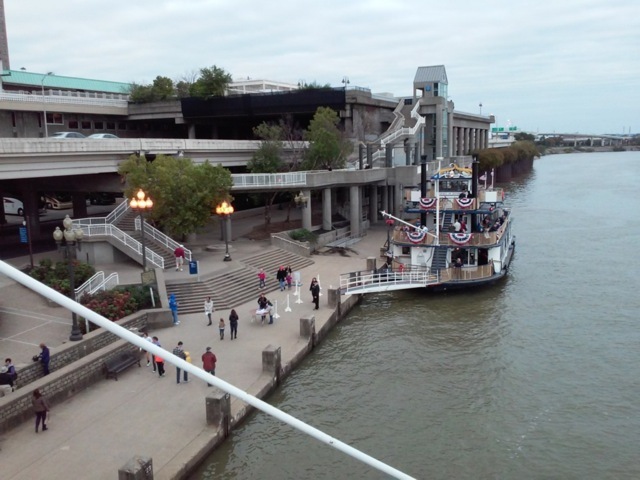 Presented by Fifth Third Bank on Oct. 18, the celebration will kick off at 1:30 p.m. with the Mark Twain Riverboat Parade down the Ohio River featuring all boats. 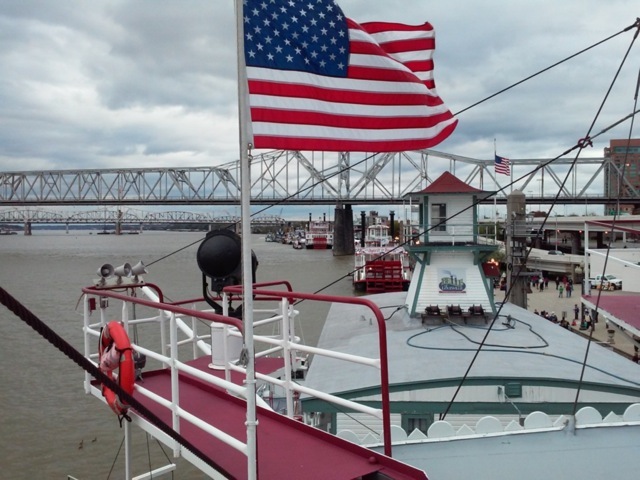 Later in the evening, there will be a display of fireworks over the Ohio River as the crowd sings Happy Birthday to the Belle of Louisville. • Friday, Oct. 17, 5 p.m.- 10 p.m.
• Saturday, Oct. 18, 11 a.m. - 11 p.m.
• Sunday, Oct. 19, 11 a.m. - 7:30 p.m. If you don't have a bicycle the festival will offer bicycle rentals by Wheel Fun Rental, located at the base of the Big Four Bridge. A series of customized cruises will also be available throughout the six-day festival. 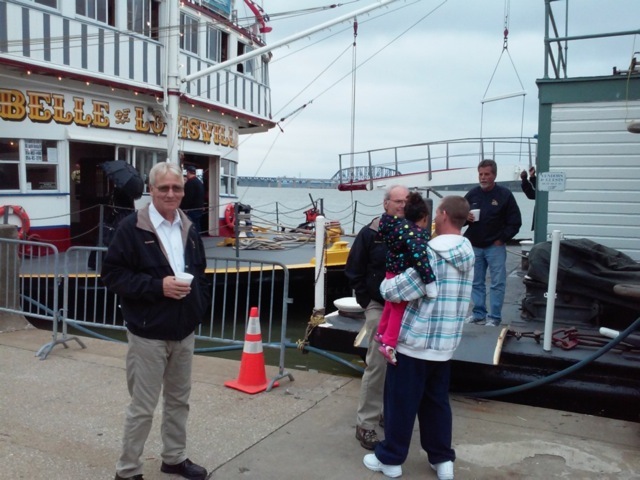 For a complete schedule, please visit www.festivalofriverboats.com. 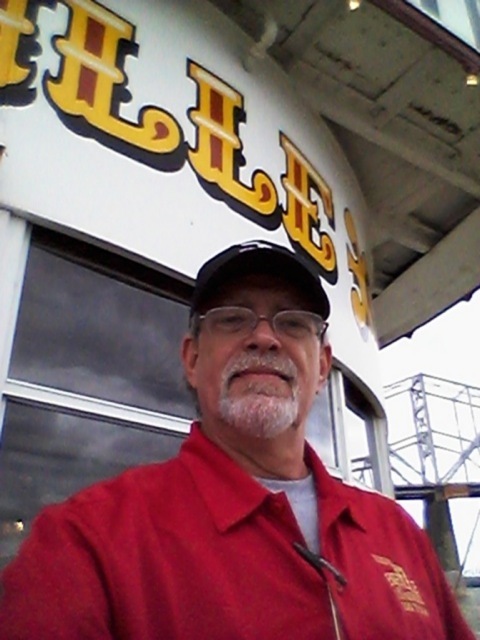 The Official Festival Artist for the Centennial Festival of Riverboats is Michael Blaser! He has created an original painting and will print reproductions that will be sold through Louisville's print and framing gallery network. These images will be a reminder of this event displayed in homes and businesses around the community and region for many years to come. 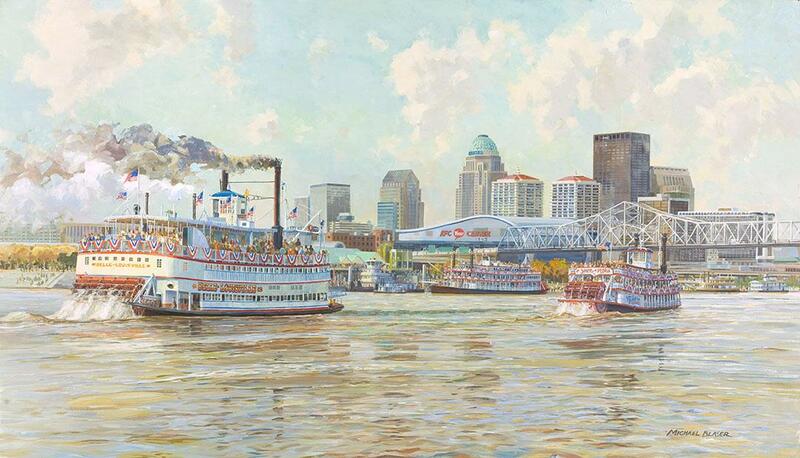 Michael has also created a painting of the Belle of Louisville that will be printed on select festival merchandise. Michael will have a booth at the event with the Official Portrait as well as many other river prints & giclees on display. Only 400 paintings will be created so be sure to get yours today! To purchase from the artist, please call 1-800-383-0669.